What is the proper relationship between the individual and the state? What does it mean to be loyal, and with whom should our fundamental loyalty lie- with lover or friend, family or mentor, ancestral mandate or status quo? How does one sort one’s priorities, and can they be unified? What can one hope for, and what can one retain, under the totalitarian boot? These are just a few of the questions grappled with in the 1959 epic Ben-Hur, starring Charlton Heston. Heston plays Judah Ben-Hur, a provincial aristocrat-prince on a journey that will turn out to be (we moderns might say) personal, political, and indeed spiritual, against the backdrop of first century Roman-dominated Judea and the deeds of a certain prophet. Though the setting is remote in both time and place, Ben-Hur is the Angry Young Man, the Rebel Without a Cause- he is a force unto himself, young, male, and physically imposing, at odds with almost everyone he meets (at first) and a deep critic of the establishment. The film’s screenwriters (of whom prominent author Gore Vidal is one) are clearly still working out one of the dominant preoccupations of the fifties: how to reconcile youthful rebelliousness, and indeed the very concept of an individual will, with a monolithic state that demands (and practically ensures) an all-encompassing conformity of not only deed but also thought (America, or in this case Rome). Early in the narrative, we are presented with two alternatives in the form of Judah himself and a Roman citizen he saved as a boy: Messala. Unlike his provincial and individualistic savior, the young Roman is ruthlessly ambitious, and throws a boundless energy towards his own advancement and the sadistic enjoyment of a personal power that the government affords a select few. Messala returns, a newly minted tribune, to rule Judea and says in no uncertain terms that he will accept nothing but his old friend’s total loyalty and assistance with the task of further subjugating the province. By refusing to betray his people, Judah seals his and his family’s fate as captives and slaves, and by way of trumped-up charges, is sent off to row, chained to an oar in the galleys. During a fateful shipwreck, Ben-Hur ends up saving yet another life, this time that of the relatively noble Roman consul Quintus Arrius. Arrius, the sonless paterfamilias, adopts Ben-Hur and names him Quintus Arrius the Younger. The gaining of a second name further fragments Judah’s loyalty and identity, and we are treated to more than a few shots of the brilliant Heston’s portrayal of agonized, soundless internal conflict. He truly loves his new, Roman father, but still has business back east. It may be of note that Judah’s real father is never mentioned or seen, and his entire family- mother, sister, and romantic interest Esther- is female. So in Jerusalem, Ben-Hur is an authority without equal, sole protector and alpha male. This role will deepen when Ben-Hur later returns to defeat and mortally wound Messala in a chariot race and is called by Pontius Pilate “their [his people’s] one true god- for the moment.” Perhaps this all goes to his head. What happy outcome is possible for one who opposes Rome, or any equivalent entity? Judah soon removes the ring of his father Quintus Arrius, and thereby renounces the protection of his mentor. The ever-pragmatic Pontius Pilate offers hothead Ben-Hur this line of wisdom: “Perfect freedom has no existence. A grown man knows the world he lives in. And for the present, the world is Rome. Young Arrius, I am sure, will choose it.” Here it is: that acceptance of the things as they fall, that old, pre-scientific determinism that could be called a faith in fate, that goes back to the Stoics. Judah has the choice of a prosperous life as an adopted Roman, but he throws it away, still haunted by that mirage of his forefathers: an independent state for his people. 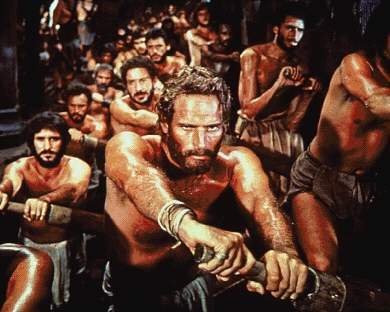 Ben-Hur, despite victory against Messala and numerous improbable escapes from death and meaningless servitude, would have gone on grinding his unbreakable will against Rome till he was nought but dust. As the dying Messala croaks, “The race… the race is not over. It goes on, Judah. It goes on.” With his mother and sister crippled by leprosy after spending years in a Roman dungeon, Ben-Hur can find no outlet large enough for his vengeance and hatred, and is unable to enjoy his love for Esther. As we, the mid-century American audience are shown, rebellion blocks the individual from the comforts and pleasures of conformity, and poisons his relationships with other members of the tribe. It is only after he shrugs off his juvenile antics, that the young man can get down to the agreeable business of producing offspring. Sooner or later, our protagonist would have met a bloody end, were it not for the interventions of a certain proselytizing rabbi. A man we can only conclude (from his luscious golden locks and pristine white robe) is Jesus of Nazareth, gave Ben-Hur water while he was trudging, chained and enslaved, across the desert. Later, when Ben-Hur is at his true crisis of identity, he finds redemption in giving the convicted Jesus a sip of water- in returning the favor. Here we have the solution: not violent revolt to precipitate political change, but simple reciprocity at the individual level- the Golden Rule. After watching the prophet crucified, Judah returns to find Esther waiting for him, and his sister and mother cured of leprosy. The film ends with Judah returning home, embracing his family, and saying the words: “And I felt His voice take the sword out of my hand.” His fiery passion has been quenched with love; he has made the transition from charismatic rebel leader to placid Christian. Thus, we are shown the route by which one can reconcile oneself to odious and arbitrary earthly powers: disregard all public ambitions and national concerns, and focus on the domestic unit. Project all hopes onto a kingdom that is not of this world, and stay in one’s house, with one’s family, where one belongs- and be thankful Rome has allowed one even that. Nietzsche would be proud.